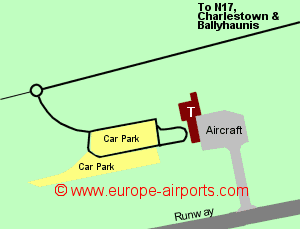 A shuttle bus service operates between knock airport an Charlestown, from where the same bus company operates long distance routes across Ireland. 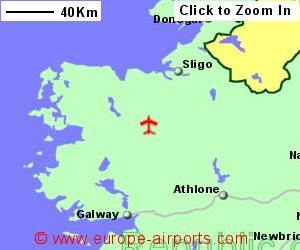 Taxis are available at Knock airport and a journey to Knock, or the nearest train station is likely to cost 25 - 30 Euros. Facilities include 3 bars/cafes/restaurants, 4 shops, currency exchange, and ATM, 4 coin operated Internet access points, and FREE unlimited WiFi Internet access. A 5.5 million Euro extension to the terminal building was completed in March 2009 doubling the existing check-in area, security screening and departures lounges. 734,000 passengers passed through Knock airport in 2016, an increase of 7% from the previous year. 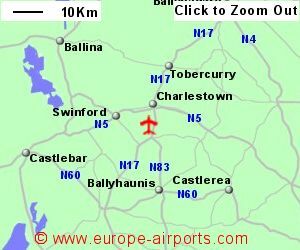 Knock is the 4th busiest airport in Ireland.